Today is Tuesday. Today, I spoke with a friend who is going through a very rough time. She has been in and out of court countless times and her faith in a system, her faith in humanity is long gone. She told me today that the corruption, the unethical behaviour of people one should be able to trust is just about non- existent. She doesn’t laugh at me when I tell her that no one involved in my son’s case had any moral integrity. Unless you experience it for yourself first hand, you would never understand the layers of lies. For all those who have loved someone in prison and have had to deal with a “justice” system filled with morally and ethically bankrupted people. He talks to her like she’s dirt under his shoe because she has no money. Be at peace my friends. My heart is missing so many pieces it doesn’t look much like a heart anymore. Today is Monday. Today is Memorial Day, a US holiday that most will celebrate with a day off, barbecues, or the last day of a week’s vacation before traveling home. Still some especially the older generation will go by graves to pay respects. It is a day when many Americans will fly their flags and other red, white and blue decorations. My grandfather had served in WW2 and Korea. My father was in the Navy as was one of my brothers. Another brother served in the Marines and I am an Army veteran. In Paul’s family, his father was in the Navy and served in Korea, and two of his brothers served in the Air Force. Paul served in the Army and Air Force and our son served in the Air National Guard. While all of us received various medals for service, Matt was given the Chief’s Award for Excellence which is awarded to only one airman in a Flight. None of us has ever had to serve in combat and I am grateful for that. I know too many people whose sons have seen combat repeatedly and I suspect you have, too. They are very damaged people physically, mentally, and emotionally. On this day, I am mindful of all people who have died in wars. We are mindful of soldiers, and civilians; men, women and children who did not escape the falling bombs, gunfire, crumbling infrastructure. I want peace. I want peace for the children who go to bed at night not hearing a barking dog or crickets, but explosions and screams, wondering if it will be the last night they know. I want peace from warmongers and war profiteers, from arms dealers and imperialism. I want peace. I want to remember that there is nothing good about war…nothing. I truly wish you peace on this Memorial Day. Today is Sunday. Today, like pretty much every day, I am handed a load of sh*t. I take my dog for a walk every day and most times twice a day. I am the holder of the “poop” bag. Yes, we are responsible pet owners, who clean up after our little dog. Some days the bag is so full, I feel like she has the intestines of a great Dane instead of a miniature pinscher. Depending on how far we walk, I may have to carry this bag of poop for awhile. Let me be clear, it stinks. I got to thinking about this tonight as I went for the second walk with the dog. The bag got filled and it was particularly pungent. Even though it’s a cute blue bag with paw prints on it, that doesn’t affect the smell. Everyone gets handed a load of sh*t by someone, and I mean this figuratively..:) Do we carry it around with us and let it ruin our day with it’s foul stench or do we dump it? On my long walks with Fiona, there is a city trashcan that gets her deposit. If I take a shorter walk than, I have to wait until I get home to toss the bag into my outside trash container. I certainly don’t take it into the house and keep it with me for the duration. So, why would I carry around someone else’s sh*t? Wouldn’t it make sense to dump that poop and forget about it? Life is too full of drama and issues to deal with someone’s nastiness. Sometimes these people are full of it and they keep throwing the poop; but it doesn’t mean we have to sit in it. Focus on something positive and take little steps to deal with the issues. It’s been a rough week and I suspect it’s going to get rougher. Matt was handed some sh*t the other day. We are going to flush the stuff and take action. One thing about my son, he doesn’t hold on to “poop bags” for very long. He turns his frustration into something constructive. I hope you can forgive me for the analogy. It just seemed perfect for the kind of poop our family has been subjected to lately. Please keep us in your thoughts and prayers and by the way, June 11 is Matt’s birthday. I would be sincerely grateful if you could drop him a card and cheer him. Today, I read a story how 3 men from Portland selflessly faced a white supremacist who was spouting hate speech at 2 young Muslim girls, one wearing the hijab. Tragically, we live in an environment that not only tolerates this horrible behaviour; but actively motivates racism. I am a white woman. I have never understood how anyone could despise another human being based on colour, culture, language, religion or gender. I grew up outside of Boston. I served in the Army. All this to say I have met so many different people. Today, I talked with my son. He has not given in to despair after some pretty nasty news. He knows his family will fight for him until the end. I could see him standing up against the racist behaviour because he has done so many times in prison. The story ends sadly about the white supremacist; he stabbed to death a 53 year old man, a 23 year old man and put a 21 year old in the hospital. Rest in peace Taliesin Meche and Ricky Best. You are the epitomy of selflessness. Love my friends..please don’t buy into the rhetoric. Today is Friday. Today, I spent a few calls encouraging my son and he encouraged me. 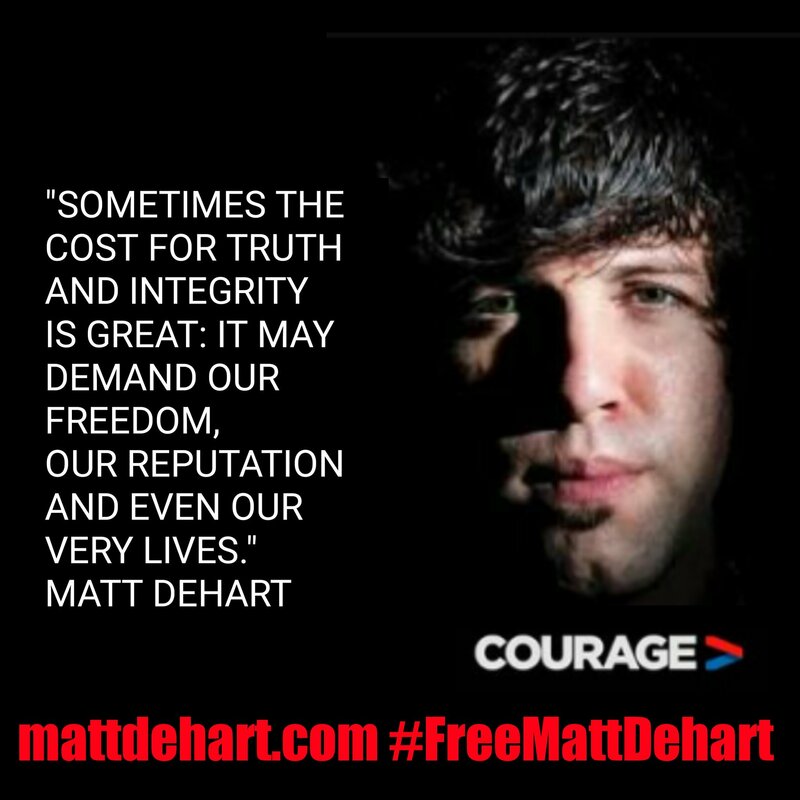 We got some very disturbing news that lets us know that duplicitous and evil people are still trying to harm Matt. All governments are evil and this one is no exception. God help you if you are a whistleblower, journalist, truthteller, activist or protester. You are a target pure and simple. I have never seen the Stazi like activity as it is now. The German Stazi would qualify as girl scouts compared to those who participate in surveillance and war on this country’s citizens who have a conscience and take a stand against corruption, greed and evil. My son’s fight for justice is far from over. His parents will continue to stand with and for him. We believe in the power of truth and we will not waiver to shine the light on the evil that besets us. Be of good courage because this world can be a very scary place. Today is Thursday. Today, I received another letter from, let’s call him Joe, who is incarcerated in the great state of Florida and I say that tongue in cheek because Florida has some of the worse prisons in the country. I want to share a little about Joe. Joe had mental health problems and self medicated using illegal drugs.. Tens of thousands of people if not more fall into this trap because of the lack of good insurance and even with good insurance, normally, mental health treatment and drugs are not included. So, under the “war on drugs” agenda, Joe went to prison. When he got out, he was violated for having some drugs on him. If you are not aware, there is no safety net for folks when they get out of prison. I was told that my son, according to his conditions would have to have mental health treatment even though my son takes no medication and is coping in prison with ptsd. I was also told the cost of such treatment is prohibitive meaning it is very costly. REALLY? I live in America. Of course it’s costly. My kid has no insurance. Anyway, back to Joe. He has the kindest heart. He explains that he doesn’t blame anyone but himself for being in prison. He takes full responsibility for his actions. He shares that he is not afraid of other inmates and some of them have serious problems. Joe is afraid of the guards. He said they are abusive, conniving and are not without issues themselves. They have terrible anger issues and they take their frustrations out on the inmates. I have heard this countless times by some of the folks I write. Even my own son was given this “pig slop” in Bowling Green. Joe tells me he prays for everyone. He prays for the system to change. He wants to get out of prison and start a Prison Support group. I hear this a lot, too. These are people in prison. These guys are non violent offenders where Joe is serving his time. These people are not animals who deserve to be given “pig slop.” They don’t deserve to be abused and in fear of their lives from guards who need help themselves. This is capitalism at its finest. Prisons make money and it’s not going to the guards or to taking care of the prisoners. Rehabilitation is a third of the cost of maintaining a prisoner. But, the greedy don’t care about people just $$$$. I have been given the privilege to write Joe. He is a hero to me. He is a hero because he recognizes he is human and makes mistakes. He prays for the guards because even in their brutality, he sees them as human beings who are suffering too. Suffering people either become bitter, self absorbed and toxic, or like Joe, they are the shiny stone you find on the beach that has been beaten by a thousand waves until all the rough edges are worn away and the inner beauty is exposed. For Joe: It’s people like you who make me believe in humanness and you are the reason I will keep vigil for those who I have been given the opportunity to encourage. Please pray for my friend, Joe. Today is Wednesday. Today, it rained incessantly for the entire day. Today, I checked my mail and received several letters from my incarcerated peeps. I had just sent my first letter a couple of weeks ago to one man in Florida. He was thrilled to receive it. He said I was a small light in the growing darkness around him. He is a poet, a lyricist and musician. I can’t imagine a sensitive soul like his being caged. Today, I am making plans to fast once a week for those I write in prison. I want to be reminded how fortunate I am to sleep in a bed with a pillow (that’s what Chelsea Manning wanted: her pillow), take a hot shower alone, eat pizza and gelato, watch anything I want on television, drive a car, hug a family member. Some days I just feel so overwhelmed for these men and women in prison. I can’t change a very bad system; but I can be a small light in their darkness. I can reach out and send resources and more importantly friendship. Imagine if every person reached out to a soul in prison. Most people in prison are in for non-violent crimes. Just like the story in “Day 438”, wouldn’t it be wonderful if we had communities that encouraged and helped released peeps get a second chance at life. The reality is many will end up homeless and living under a bridge. Some will be violated for technicalities and thrown back into prison. Few will find kind hearted people who will help these peeps get a leg up in this world. All of us can do something small like write, some of us can send money, buy books, or send gift baskets.